An Afghan cleric says he will sell all his properties to pay a reward to anyone killing the producer of "Innocence of Muslims." An Afghan cleric has offered rewards totaling $400,000 for anyone killing the producer of a U.S.-made anti-Islam film and a French cartoonist who drew caricatures of the Muslim prophet Mohammed. “I have offered $300,000 to anyone who kills the anti-Islam film producer and $100,000 for killing the French cartoonist,” Mir Faroq Husaini, a prominent cleric in the western province of Herat, told AFP on Sunday. He said he had first announced the reward during a sermon on Friday in a large mosque in the city. “I will sell all my properties, including my lands in Herat, to collect the money,” he said. 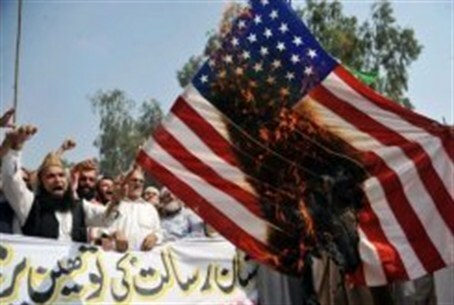 The “Innocence of Muslims”, a film that mocks Islam, triggered violent protests in at least 20 countries including Afghanistan after excerpts were posted online last month. Immediately after the film gained notoriety, French satirical magazine Charlie Hebdo published cartoons caricaturing the Muslim prophet. A Pakistani government minister last month placed a $100,000 bounty on the head of the maker of the film. Railways Minister Ghulam Ahmed Bilour also called on the Taliban and al-Qaeda to join the hunt and help accomplish the “noble deed”. Last week, Former Pakistani lawmaker Ikramullah Shahid offered a six-figure monetary reward to anyone who kills the producer of “Innocence of Muslims”. Shahid said that he would pay $200,000 to anyone who kills the filmmaker. Nakoula Basseley Nakoula, the alleged filmmaker behind the video, was arrested in Los Angeles on September 27, but the exact reasons for the arrest were unclear. Nakoula, allegedly the real identity behind the pseudonym Sam Bacile, the director of "Innocence of Muslims", was traced to a home address in Cerritos, south of Los Angeles, after international protests erupted against the video. While initial reports claimed that “Bacile” is Jewish and an Israeli, this was later proven to be false.